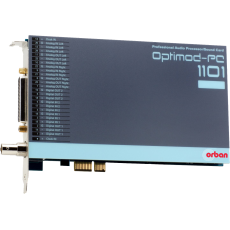 The Orban Optimod-PC 1101e professional Microsoft Windows audio processing card for PCIe bus systems offers dedicated, broadcast-quality digital signal processing on-board for audio processing, mixing, and routing. Optimod-PC processing is more reliable than software-based processors that run native on the computer's CPU because the operating system can never starve Optimod-PC's processor or mixer for processing cycles. This allows more instances of an encoding application to run glitch-free on the computer's CPU, which provides higher reliability and lower operating costs because fewer CPUs are required for large operations. Drivers are now available for 32 and 64-bit versions of Windows XP, Vista, 7, 8.1, and 10. Optimod-PC works great for both live streaming and on-demand programming. Its three on-board Freescale DSP56367 DSP chips provide a loud, consistent sound by performing stereo enhancement, automatic gain control (AGC), equalization, multiband gain control, peak-level control, and subjective loudness control. Optimod-PC boasts professional AES/EBU digital inputs and outputs, plus balanced analogue inputs and outputs that can operate at professional +4dBu reference levels while resisting pickup of hum and noise. Optimod-PC's audio driver allows it to appear as two standard sound devices to the computer's operating system. With one Optimod-PC, netcasters can replace selected content (such as commercials in a program originally created for radio broadcast) and inject watermark encoding for ratings. This approach maintains the same audio processing path on both program and inserted audio, delivering a polished, consistent sound while eliminating the number one listener complaint: loud commercials. Drivers are now available for 32 and 64-bit versions of Windows Vista, 7, 8, and 10. Without Optimod-PC processing, audio can sound dull, thin, or inconsistent in any combination. Optimod-PC's multiband processing automatically levels and re-equalizes its input to the "major-market" standards expected by the mass audience. It also helps overcome background noise in mobile listening environments. Orban's PreCode technology manipulates several aspects of the audio to minimize artifacts caused by low bitrate codecs, ensuring consistent loudness and texture from one source to the next. PreCode includes special audio band detection algorithms that are energy and spectrum aware. This can improve codec performance on some codecs by reducing audio processing induced codec artifacts, even with program material that has been preprocessed by other processing than Optimod. There are several factory presets tuned specifically for low performance, low bitrate codecs. Digital mixing is crucially important to a netcaster who needs to control commercial content and insertion. Unlike most sound cards, Optimod-PC lets you mix an analogue source, two digital sources, and two Wave sources. For example, you could run a playout system on your computer while using the three hardware inputs for a live microphone feed, commercial insert, and network insert. Or you could run the commercial insert playout software on the same computer as the main playout system, using Optimod-PC's second Wave input to separately route the outputs of the two playout systems to the card. In most cases, an external mixer isn't needed, making Optimod-PC a more economical system solution than a low-priced sound card combined with a bunch of external hardware. This is also perfect for podcast production. Optimod-PC comes with over 20 great-sounding presets that make it easy to create a sonic texture that's just right for your target audience. If you want to customize a preset, you can start with an easy LESS-MORE control, and, if that's not enough, tweak over 50 parameters to hone your sound to perfection. Optimod-PC's deep interface will never hold you back as your processing expertise increases, yet its carefully crafted design insulates you from the details if you need great sound right now.